mount roberts tramway | Cary Kopczynski & Company, Inc. The Mount Roberts Tramway is one of the most popular attractions in southeast Alaska. It entails an adventurous 1,800 foot ascent through Southeast Alaska rainforest to a lodge high above Gastineau Channel, providing visitors with panoramic views, a 150-seat restaurant, a 120-seat theatre, and gift shops. 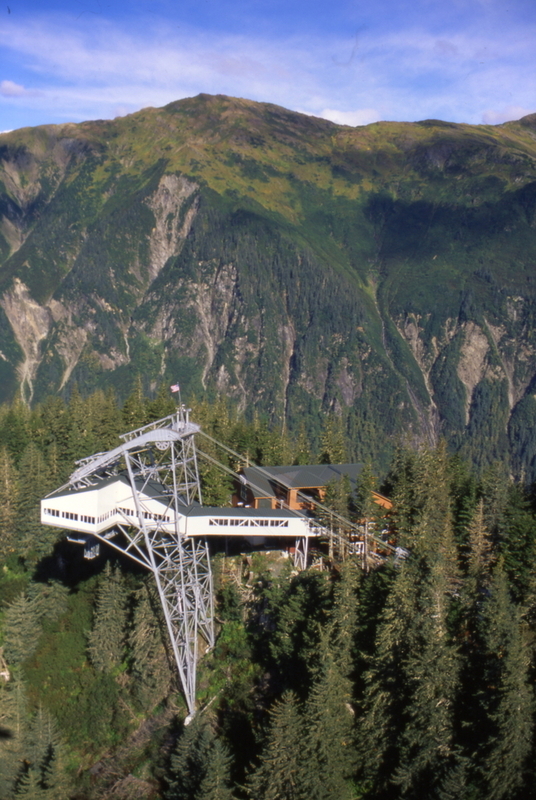 The aerial tramway consists of two 60-passenger cars, supported by cables spanning between towers located near the cruise ship dock at the bottom, and the visitor lodge at the top. CKC provided structural design for the lower tram terminal building, the upper tram visitor lodge, and the skybridge linking the aerial tramway to the upper lodge. The terminal buildings are steel frame structures supported by pile foundations. Seismic forces are resisted by internal braced frames. The skybridge is constructed of both horizontal and vertical structural steel trusses that carry both gravity and seismic loads.